Peugeot used car parts have been our specialty for many years now. We sell Peugeot used car parts for 106, 107, 108, 1007, 206, 207, 208, 2008, 306, 307, 308, 3008, 406, 407, 4007, 4008, 508, 5008, 607, 806, 807, RCZ and the Peugeot vans Bipper, Partner, Expert and Boxer as well. Search our stock or request the used car part you are looking for. Our stock covers a very wide range of Peugeot used car parts, just tell us what you are looking for and we will probably be able to help you. We have got engines, gearboxes, rear axles, ECU computers, doors, bonnets, steering racks, steering pumps, etc. in stock. But we can provide you with many more used car parts. As we do our own cardismantling we have many possibilities, even for some tailor made car part solutions. We check the quality of our second hand car parts very thoroughly at several stages in our dismantling process. We want to make sure that the part you order will fit your car and that the spare part is in good shape. In case a part should break down it is good to know we have our Peugeot used car parts warranty system. Except for the electrical parts there's a mimimum warranty of 3 months on all parts. You can extend this period by paying an extra percentage when buying the part. By doing so you can even get a lifetime warranty, labour and shipping costs can be included on request as well. 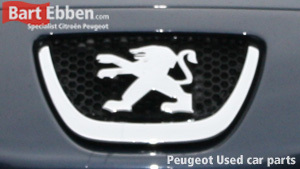 We ship Peugeot used car parts to destinations worldwide. After sending us a part request our salesteam will help you to order exactly the right used car parts as comfortably as possible. Our parts are packed carefully and are shipped experienced shipping companies only. Ensuring that the Peugeot parts will properly make the trip to your location and within reasonable time. Contact our salesmen for specific shipping details. Besides Peugeot we are also specialized in Citroen used car parts.